This strain is blessed to be called #1 in recent years of Cannabis Cup voting. Oh, and it’s the only strain to be blessed by a Rabbi. Few strains have dominated the award circle and the market like Kosher Kush. Reaching THC levels of 30% is not uncommon for this top shelf bud. It is dense, pungent, earthy, and frosty like a smelly green snowball. Koshers Kush certainly contains great indica qualities. Genetics: Kosher Kush is bred from an OG Kush plant and, as said before, was actually blessed by a Rabbi. Flavor & Aroma: Similiar to many Indicas, Kosher Kush smells of sweet pine and earth, and a touch of musk to remind one of the olden land. Effects: Kosher Kush is a heavy Indica with extreme sleepiness to follow any other effects one may feel when using this strain. Medicinal Uses: Medically, Kosher Kush is great for PTSD sufferers, as well as the depressed or otherwise mentally stressed. Pain relief, as well as an increase in appetite, goes to show why a Rabbi actually chose to bless this wonderfully gifted strain. Potency: The plants that won the Cannabis Cup 2 years in a row tested out at above 29% THC, but the ones you'll find in dispensaries near you will probably only reach up to 25%. CBD levels generally range from .3-.5%. 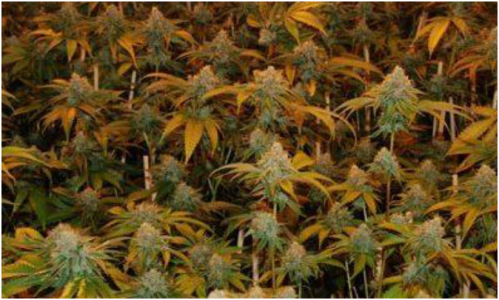 Grow Info: Flowering time is about 10 weeks with good yield.